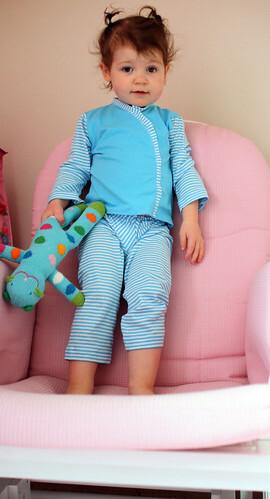 I am trying to begin making pajamas for my little girl now. It is just outrageous how expensive pajamas can be, unless you get them on clearance. They are also usually too tight around her wrists and ankles, or way too long. I wanted them to be comfy, so I used t-shirts and knits of mine. This was my first go at it. I created the pattern myself and went for a faux kimono shirt look. I like this way the best so far, but I did try another method to go for the same look on another one. Here is the second one I made her. I did it differently, but it came out good. She really likes it because it has flamingos on it. She didn’t want to take it off! I made it from a t-shirt I picked up on our anniversary trip. I figured the pj’s would be her souvenir. 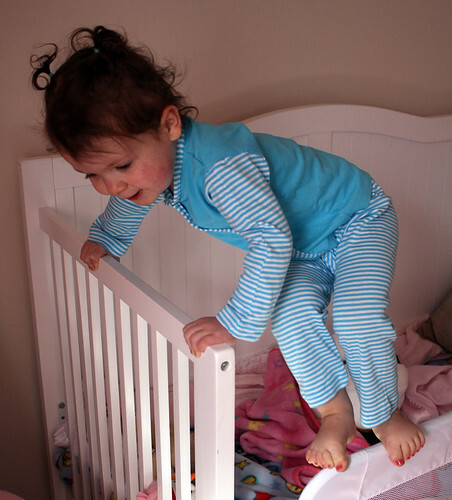 Then she decided to be her little monkey self and have fun climbing on everything instead of letting me take pictures. 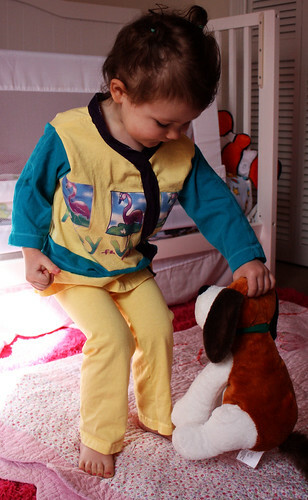 Nice pajamas and a very sweet little girl. 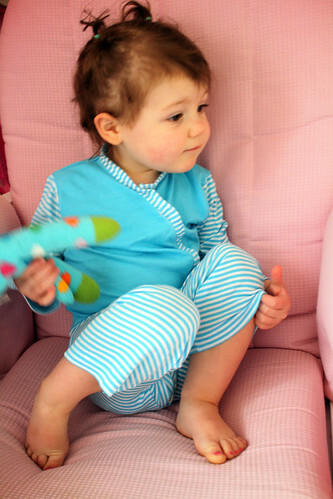 You are right… why are kid’s pjs so expensive? Great idea. Love the faux kimono look. Taking pictures of toddlers is so hilarious! 🙂 I have to bribe my 3yo usually, to model stuff I’ve made for photos. The pj’s are adorable. They look so comfortable. i hate those polyester cheapy ones they usually sell in stores! UBER cute… can we expect any sort of tutorial…I HATE how expensive jammies are, we are expecting number three and this would be great fun! 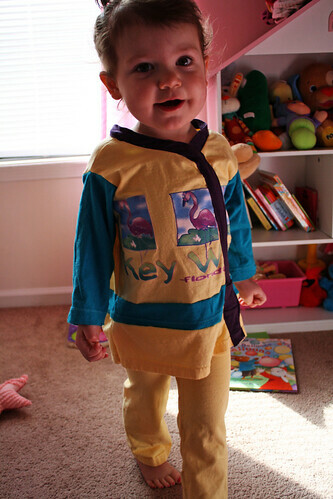 I do kimono style jammies for my kids too. Yours look terrific. That blue set is awesome, I think I like the stripes. Soooo cute! I hate store bought pjs…..they always have the itchy tags in them! Nice pajamas. I especially like the turqoize ones. Very cute! She is just so adorable and so are her jammies. I too have made sleep pants for my boys. I went into Wal-Mart one day and the store had $10 on sleep pants. I bought a pattern and some flannel and made them for my 3, my 2 nieces and 2 neighbor kids. I probably would have been money ahead to buy the $10 pants but I had so much fun making them for the kids! When they outgrew them last year I went back to the store and bought the larger pattern and started all over again. 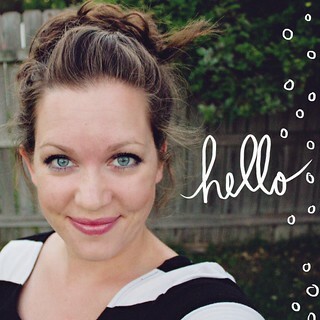 Your kimono style is adorable and what a cool way to use up some of your old t-shirts! Way to “upcycle”! 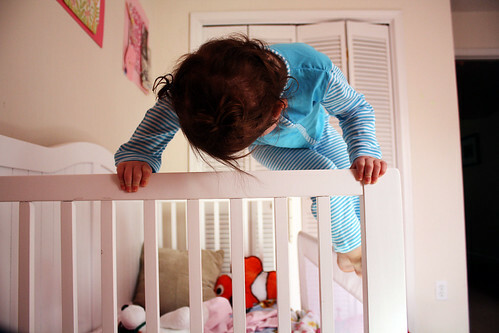 BTW love the picture of Little Miss climbing out of the crib. Boy, does that bring back memories! adorable PJ’s!! love them both! Love the kimono look! so cute! I love this! When’s this pattern coming out….because I wanna buy it!!!! I’m actually working on three patterns right now 🙂 Over ambitious I know, but I get bored quick!